As August comes to a close, we take a look back on the past year and feel grateful for the many volunteers who have helped out with everything from tree plantings and historic reenactments to running our local farmer's market and restoring historic windows. We are especially thankful to have spent the year working with 24 AmeriCorps volunteers, who have helped to make a difference in the AFHA region in more ways than we can count! Thank you for your service! 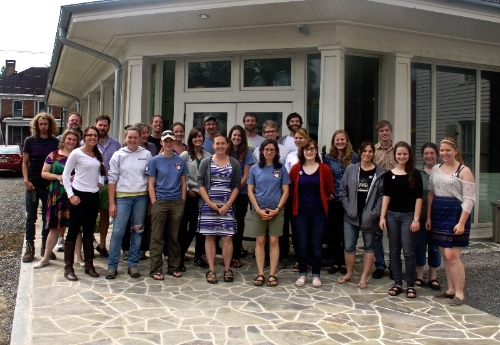 The 2013/14 AFHA AmeriCorps team, posing for one last group photo at the Beverly Heritage Center. The new team will begin their training in early September. The Randolph County Jail, one of T.R. Whiteman's building in Elkins, WV. The T.R. Whiteman Catalog was born from a request made of the Elkins Historic Landmarks Commission (EHLC) by one of Mr. Whiteman’s grand-daughters, Mrs. Marilyn Seitz. In the fall of 2012, Mrs. Seitz contacted the landmarks commission to gauge the feasibility for a photography project. It had become increasingly difficult for this Elkins native to make the trip from her current home in Virginia’s Shenandoah Valley to Elkins, her birthplace and home for her young adult life. She wanted a visual memento of the many buildings around Elkins that were designed and/or constructed by her grandfather. 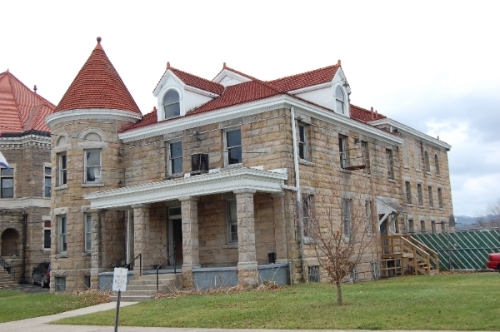 I agreed to take on the project as my major project for my second AmeriCorps term for one of the sponsoring sites, the Elkins Historic Landmarks Commission. Thornton Russell Whiteman was born in born April 15, 1875 in Hampshire County, WV (West Virginia Births Index, 1853 – 1969) to Edward T. & Hannah Catherine Whiteman. The family moved west to Randolph County and the 1880 census shows them residing in Mill Creek where T.R.’s father farmed. 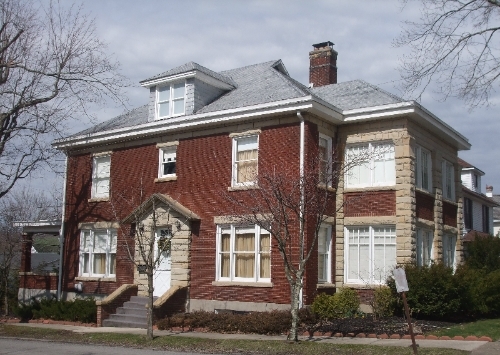 The building designer and contractor arrived in Elkins in 1904 and by the following year, he had completed his first residential commission on Railroad Avenue (no longer extant) for Mr. W.H. Mason. His building career spanned almost 40 years, completing his last project in 1943 for Don C. Harper in the Mouth of Seneca (now Seneca Rocks) community. Whiteman’s work included both residential and commercial properties and his work spans beyond Elkins into neighboring WV counties and states. T.R. Whiteman died at the age of 91 in May 1966. In 1990, Mrs. Madeline Crickard, one of Mr. Whiteman’s daughters, prepared a list (Crickard list) of her father’s building projects. Based on old contracts, the four-page document lists 149 of Mr. Whiteman’s building projects. The list is comprised of his clients’ name(s) and the building or property address. Unfortunately, the complete address (i.e., street number and name) was not provided for approximately one-third of the properties which prohibited a comprehensive catalog. A residential structure in Elkins, WV, another T.R. Whiteman building. Research and fieldwork began in the fall of 2013. However, due to wintry weather, the photo-documentation did not begin in earnest until the spring of 2014. Research sources included land records in the Randolph County Courthouse Clerk’s Office, Sanborn Fire Insurance maps, Polk Directories for Elkins, WV (various dates), and oral interviews. For those properties where a complete address was not provided on the Crickard list, the client name was searched in the Polk directories and in the Grantee-Grantor Index books in the County Clerk’s office. Regrettably, none of those names that were researched appeared in either of these. In some cases – where the subject building is located in a more densely developed area - , it’s quite apparent which of the properties Whiteman did build. However, without verifiable proof, that would be conjectural. To actually conduct the fieldwork, the Crickard list was re-arranged by address. This arrangement provided a more logical sequence for the survey and provided a more effective use of time and resources. The buildings were photographed using a Fujifilm Finepix digital camera and saved as JPEG files onto DVD-R disks. The images comprise the catalog portion of the manuscript. The project background serves as introduction and explanatory section. The appendix is comprised of two Microsoft Excel documents. The first provides information that is identical to that which appears in Madeline Crickard’s 1990 list. The second spreadsheet is what was used for tracking fieldwork progress and resulting annotations such as property condition and location details. It’s my hope that the catalog will provide local architecture and history scholars with valuable information about Elkins’ building trends during the first half of the twentieth century and one of the community’s most prolific contributors to the local landscape. Whiteman incorporated the Queen Anne, Craftsman Bungalow, and American Foursquare architectural styles into his projects thereby placing Elkins on a national platform of leading architectural styles of the day. Whiteman built in every style of his day, built for the local business man and local family man, and did so in every facet of the community. Holmes, organizing some last-minute details at Snapshot Day. 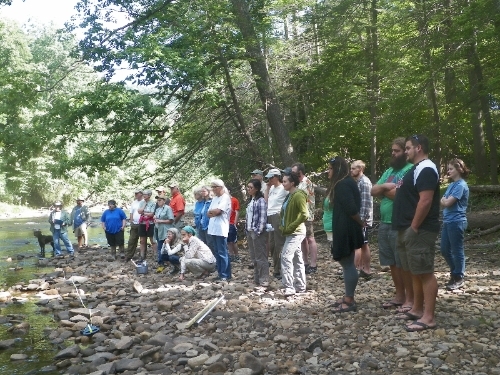 On Saturday, August 2nd, 30 volunteers for Trout Unlimited's West Virginia Water Quality Monitoring Program gathered in the Monongahela National Forest. After months of meticulous planning our Snapshot Day was finally happening. I thought I had covered everything as I planned for the day. From the caterer to the extremely specific driving directions, everything was in place and the day was going to go smoothly. Yeah, right! What I hadn’t planned for was a surprise family reunion at the recreation area where I had booked the event. I also did not anticipate the 15 foot drop-offs into the streams below, or what seemed to be fields of poison ivy. And I had a few issues with roads that apparently do not exist, despite being on Google Earth, GIS, and a recent version of a road atlas. Trout Unlimited's Water Quality Monitoring Volunteers at Snapshot Day. Now thankfully, most of these things happened to different people; I don’t want it to seem like one volunteer had to experience all of these issues at one time. But this just goes to show that no matter how much preparation you put in to an event, things can still go wrong. It is almost inevitable! But, at the end of the day it turned out to be a great event. 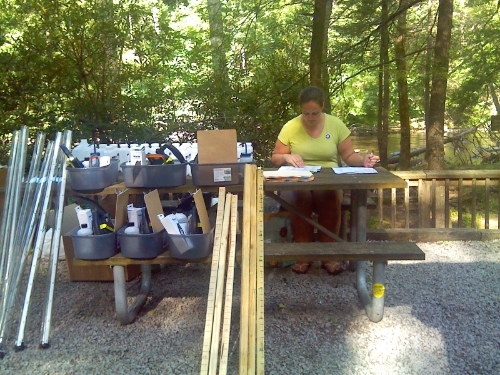 We were able to gather data and samples from 54 streams across the northern part of the Monongahela National Forest! Snapshot Day was also the last time that I was able to see all the volunteers of the project that I have spent this entire year developing. Making all of the plans for this event, the absolute last thing that I planned for was being so unhappy at the end of the day. Some of these volunteers joined the project less than six months ago, but I feel like I have known them for much longer. As they left at the end of the day I realized that I have created some everlasting ties to West Virginia. Although I am leaving next week to start my next adventure, I plan to be back in the future, which is something I hadn’t planned for. 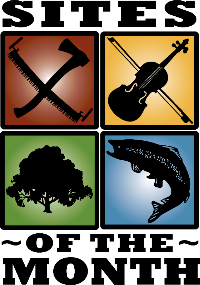 The Potomac Highlands Cooperative Weed and Pest Management Area is a partnership between federal, state, and local agencies, community associations, non-profit organizations, and private land owners aimed at coordinating efforts and programs for addressing the threat of invasive species. The region, which spans into much of AFHA, is dedicated to decreasing the impacts of invasive species on native plant and animal communities, public and private forests, private and agricultural lands, and local economies. Check out their book, written to help educate children on the threats of invasive species! The Pearl S. Buck Birthplace Foundation & Museum is a National Historical Site located in the town of Hillsboro, featuring a modest two-story, hand-built, home where the author was born. After fleeing religious discrimination in Holland, Pearl's maternal family settled in the Appalachian Mountains. Their house contains period antiques indicative of the lifestyle of a late-19th and early 20th-century working family. The site includes 13 acres surrounded by the Monongahela National Forest. Visitors also have access to a period-era carpentry shop and barn with over 100 historic farm and woodworking tools and the log home of Buck's father's family, which was moved from Greenbrier County and restored on the site. Ben's Old Loom Barn is a working hand weaver’s shop specializing in hand crafted items made by local artisans. The barn is open 10:00 a.m. to 4:00 p.m. on Tuesdays, Thursdays and Saturdays, May through December. Weavers may be seen at work during hours of operation, and woven goods & baskets are available for purchase. Ben's Old Loom Barn is located on Cortland Road in Canaan Valley. Bear Pen Run Natural Area is one of thirty natural areas in the state of Maryland. Natural Areas strive to preserve lands with great biological diversity or ecological significance. Bear Pen Run contains a varied topography that supports spring wildflowers and songbirds. In the spring, yellow flowers from the threatened leatherwood can be seen in bloom. Cool mountain streams flow into Bear Pen Run and provide habitat for a rich diversity of salamanders and brook trout.